Gates testifies that he conspired with former Trump campaign chairman Paul Manafort to fake Manafort's tax returns, failed to report foreign bank accounts, and didn't register Manafort as a foreign agent. Rick Gates testified that he stole money from former Trump campaign chairman Paul Manafort and committed an array of crimes with his former boss. 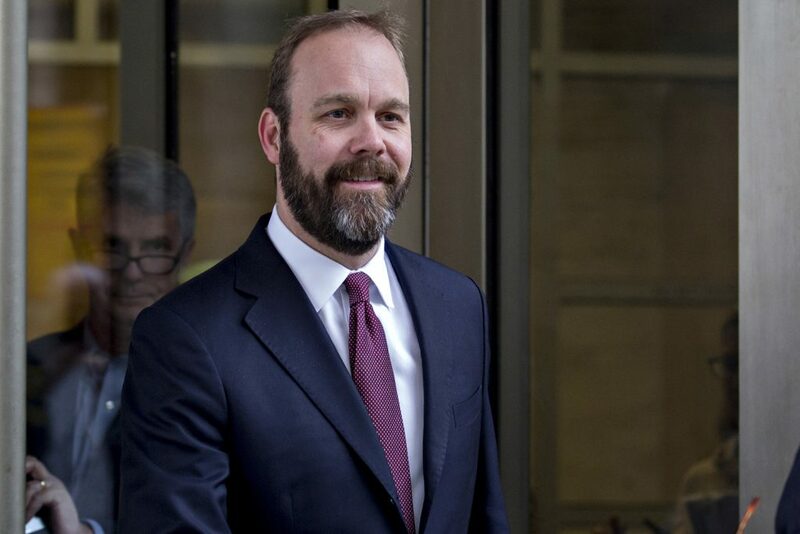 ALEXANDRIA, Va. — Rick Gates – the star witness against President Trump’s ex-campaign manager – admitted in federal court Monday that he committed a host of crimes with his former boss, and confessed to stealing from him and others. In his first hour on the witness stand, Gates catalogued years of crimes, saying most of his wrongdoing was committed on behalf of his former boss, Paul Manafort, while other crimes were for his own benefit, including the theft of hundreds thousands of dollars. Gates also made clear he was testifying against Manafort in the hopes of receiving a lesser prison sentence, having pleaded guilty in February as part of a deal with Special Counsel Robert Mueller. Manafort’s trial in Alexandria is the first to arise out the Mueller probe and marks a major public test of that investigation’s credibility. Mueller’s team is investigating Russian interference in the 2016 presidential election, and whether any Trump associates conspired with those efforts. Inside the courthouse Monday, Gates’ testimony against Manafort marked a shattering end to a relationship that made the two political consultants millions of dollars working for foreign politicians, and led them both to prominent positions on the Trump campaign. Wearing a blue suit and gold tie, Gates strode to the witness stand in Alexandria, Virginia, federal court shortly after 4 p.m., and did not waste much time before cutting to the heart of the issue. “Did you commit crimes with Mr. Manafort?” prosecutor Greg Andres asked Gates. For most of his testimony, Gates did not look at Manafort, while the defendant stared intently at his former business partner. Presented with a copy of the plea agreement he signed, Gates said he conspired with Manafort to falsify Manafort’s tax returns. Andres asked Gates whether he understood that his lies and omissions were illegal. When asked why he had lied, Gates said he had done so at Manafort’s request. Gates said he and Manafort had 15 foreign accounts they did not report to the federal government, and they knew it was illegal. “Mr. Manafort directed me” to not report those accounts, Gates testified. Gates also said Manfort had directed him to report money wired from his foreign bank accounts as loans, rather than as income, to reduce Manafort’s taxable income. By reporting it as a loan, Gates explained, Manafort could defer the amount of taxes he owed. Gates said that even while he was committing crimes with his boss, he was also stealing from him. He testified that he had control over some of the Cyprus bank accounts that held Manafort’s money, and created phony bills to siphon off hundreds of thousands of dollars. “I added money to expense reports and created expense reports” that were not accurate, he said, to pad his salary by “several hundred thousand” dollars. That testimony likely explains one of the minor mysteries of the first week of the Manafort trial. As employees of various stores and service providers testified last week about Manafort’s spending millions of dollars on suits, home entertainment systems, and cars, some of the witnesses were shown phony invoices from those firms. The witnesses said they had never seen the fake bills before. Gates, 46, testified that he had embezzled from other employers as well and that he volunteered that information to investigators once he began cooperating. Gates said he also told prosecutors he had lied in a deposition in a civil case against Manafort involving a private equity fund. As part of his plea deal, Gates said prosecutors agreed not to pursue charges on those matters, and drop a second indictment against him in Alexandria accusing him of bank and tax fraud. Gates said he was guilty of those crimes, having wired money from Cyprus through the United Kingdom to the U.S. without paying taxes on it for himself. He also admitted wiring money from Cyprus for Manafort that was not declared as income. Repeatedly, Gates insisted that most of his crimes were committed at Manafort’s explicit instruction. At one point, he rattled off the names of a dozen overseas companies he said Manafort controlled; on prompting from prosecutors he identified three more. The money in them “came from income from political consulting in Ukraine,” he said. Gates described for the jury how the two first met – at a Christmas party at Manafort’s house, when Gates was working as an intern. Gates said as he worked for Manafort over the years, his duties increased, but he still considered himself merely “an employee of the firm,” and he believed Manafort thought of him the same way. The two did not socialize outside of work, Gates said. When the lawyers interrupted the questioning for a sidebar with U.S. District Court Judge T.S. Ellis, Gates sat in the witness chair, staring straight ahead, not looking at Manafort. Manafort took a few notes and seemed at one point to chuckle to himself. Manafort and Gates were indicted together last year on dozens of charges that they conspired together to hide millions of dollars from the IRS in foreign bank accounts, and when their cash flow dried up, submitting false information to banks to get loans. In February, Gates decided to plead guilty to lying to the FBI and conspiring against the United States, as part of a deal struck with prosecutors to provide evidence against his longtime business partner. In assessing Gates, the six-man, six-woman jury will have to decide whether they believe an admitted liar when he says many of his lies were ordered by his boss. The jury began hearing evidence in the Manafort case last week, starting with the details of Manafort’s seven-figure lifestyle. They also heard testimony from Manafort’s former accountant and bookkeeper about how Manafort, with help from Gates, repeatedly denied having foreign accounts to report to the IRS, sought to reclassify payments as loans so he didn’t have to pay taxes on the payments, and altered information in loan applications. Manafort’s defense strategy has been to argue that he may have made mistakes in his taxes, but he did not lie, and the real criminal in the case is Gates. That strategy played out Monday as prosecutors and defense lawyers sparred over the testimony of one of Manafort’s accountants, Cindy Laporta. Laporta testified Friday that she knowingly submitted false information to the IRS and to banks so her client could save money in taxes or qualify for loans. She was granted use immunity to testify against her former client – meaning she won’t be charged with any crimes based on the admissions she made on the witness stand about her role. Manafort’s lawyer, Kevin Downing, tried to undercut the prosecutors’ case by getting Laporta to concede that Manafort’s finances were complicated, and that Gates was deeply involved in the process. Manafort’s trial is expected to last another two weeks, but the judge pressed prosecutors to move quickly through their witnesses. Tension between the judge and the prosecution team boiled over again late Monday as prosecutors attempted to introduce Gates’ passport as evidence of his travels to Ukraine and Cyprus. Judge Ellis interrupted them. “Let’s get to the heart of the matter,” he scowled. “Judge, we’ve been at the heart …” prosecutor Andres interrupted. “Just listen to me!” Ellis bellowed from the bench. Andres responded with frustration saying, “You continue to interpret our reactions in some way,” when the lawyers don’t do the same to the judge. “I will stand by the record as well,” Andres retorted. “All right, then you will lose,” Ellis responded. Prosecutors did not finish their questioning of Gates on Monday, and he is scheduled to return to the witness stand Tuesday. Separately, Manafort faces a second trial in the District in September on charges that he failed to register as a lobbyist for a foreign government and conspired to tamper with a witness in the case. The conduct surrounding those charges allegedly occurred after his indictment, so Manafort’s bail was revoked and he has been living in a federal jail in Alexandria while he fights the two cases against him.